Analysts and many technology reporters and bloggers had crow for breakfast yesterday; it’s time for them to get with the program. 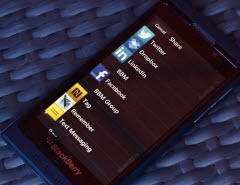 BlackBerry 10 is well along the way to becoming a smartphone market reality. And Shakespeare’s Henry V is becoming an inspiration to drive the challenge ahead. It has a 500 to 1000 year life-cycle, near the end of which it builds itself a nest of twigs that then ignites; both nest and bird burn fiercely and are reduced to ashes, from which a new, young phoenix or phoenix egg arises, reborn anew to live again. The new phoenix is destined to live as long as its old self. In some stories, the new phoenix embalms the ashes of its old self in an egg made of myrrh and deposits it in the Egyptian city of Heliopolis (literally “sun-city” in Greek). It is said that the bird’s cry is that of a beautiful song. The Phoenix’s ability to be reborn from its own ashes implies that it is immortal, though in some stories the new Phoenix is merely the offspring of the older one. This past week has seen a new RIM emerging from the ashes of its past history. A BlackBerry Jam event attended by over 1500 paying developers; demonstrations of the evolving BlackBerry 10 OS (BB10 OS) and its uniqueness; partner demonstrations involving Facebook, Four Square and Webex. And all this news was capped off by a quarterly news release reporting results that beat analyst expectations and with “no surprises”. In the rapidly evolving smartphone market space RIM’s “Phoenix” may only have a life cycle of 10-12 years for each BlackBerry generation but from the past year’s activity has emerged a new RIM. New platform, new mobile computing paradigms, new corporate culture and new opportunities for its partners. The energy in the San Jose conference center was a palpable reflection of the enthusiasm we have for what we do – I shook hands, met people, participated in a meet up with a bunch of Argentinean developers via video link, took photographs, was photographed – I even autographed phones. It was a huge blast. Confirmation of BlackBerry 10 delivery in Q1, 2013. So it’s starting to look like RIM’s cry is becoming that of a beautiful mobile computing platform. Like the Phoenix, the BlackBerry 10’s ability to be reborn from its own ashes has aspirations for immortality, the new BlackBerry 10 is beyond merely the offspring of the older one. But they’re not there yet…. Dan York was puzzled and then blown away by it: Alec Saunders Is A Rock Star In RIM’s Strange New Blackberry 10 Video. It even appeared on CBC’s The National newscast Tuesday evening. Whether the comments were positive, negative or neutral, it accomplished one major achievement: generating buzz across the Internet about BlackBerry at a time when new competitor smartphones are being launched. I don’t expect the mainstream media to get it. They’re not developers. They don’t have the context. And frankly, what most want to write about is the drama around RIM. And where does Shakespeare’s Henry V come in? Check out Alec Saunders’ post-BlackBerry 10 Jam Americas blog post, We few, we happy few, we band of brothers where he invokes Henry V’s St. Crispin’s Day speech to the English soldiers before the Battle of Agincourt. I have been thinking of it a lot recently, because that lofty inspirational speech also is a wonderful metaphor for the challenge ahead of RIM and my team, and beautifully articulates the kind of passion I have for what we do every day. Alec’s talents go beyond technology and music to include articulate prose, outlining his feelings and ambitions after 14 months at RIM. At 36:20 of this podcast, listen to Alec discuss his own music background and the production of this video. The two “Info” notes above are quotes from Alec’s post. Or close the wall up with our smartphone market dead. the company has certainly significantly moved the marker along re-establishing credibility with both users and the financial markets. Full disclosure; the author has a very,very small holding in RIM shares and has been following RIM for over 14 years. More important is his desire to see the outcome of a mobile product with true multitasking on a mobile platform due to his own long-time experience selling multi-tasking for mini-computers and PC’s. Finally several thousand Canadian and worldwide jobs are at stake. We all need to see the employment in today’s challenged economic climate.